Q: Are there student discount on all departures? A: The bus companies available through GetByBus all have different pricing schemes; some have a flat price for all passengers, others have an adult price and discounts for specific groups which in most cases also include a student discount. Q: How to check if student discount is available for a departure or not? A: Try to search for bus connection on Getbybus.com – e.g. 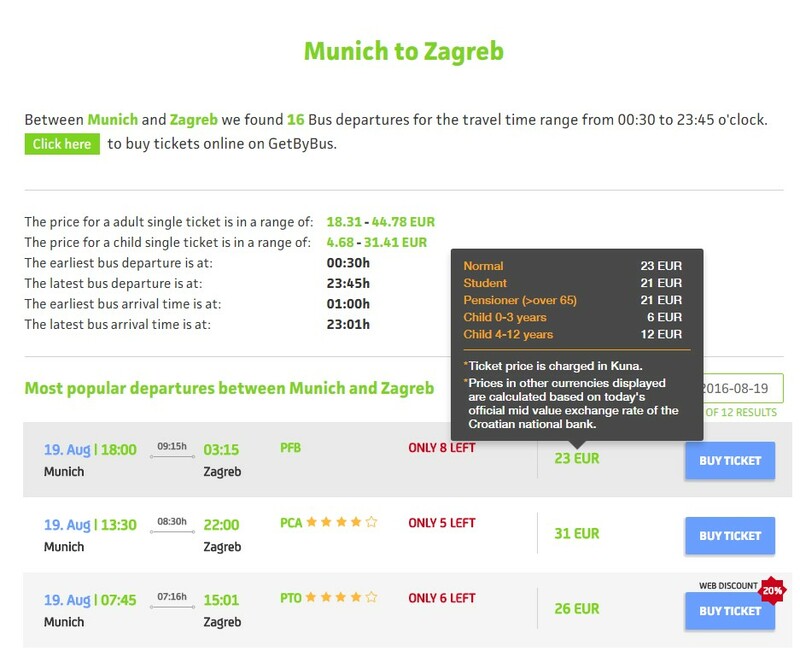 you search for a bus from Munich to Zagreb, on the search result you now hover (put your mouse cursor over) the price, then you will have a small window popping up which shows the prices for discounted groups available on a specific route. If it says student, then there is a student discount on that specific route. Q: Is there a student discount on return ticket? A: Yes, in most cases if you pick a company which has student discount on the outbound route, most of the returning routes from that same bus company will also have the student discount available on the returning leg. If you pick another bus company for the return trip, you can also pick a route which has a student discount. In that case what you are buying is actually two single tickets and not a discounted return student ticket. Q: Is the student ticket always cheaper then regular ticket? A: No, not always. Usually, the cheapest ticket you can find for a specific route is the early bird ticket. If your route has an early bird discount, you will see a discount symbol next to the price on the search result; you can also check here to see all routes which have a special discount. Q: What student card or evidence do I need to buy a student ticket? A: Basically none of the bus companies has any specific rule in relation to which student ID’s are accepted. It is basically up to the driver to approve it by check in. From all the students who bought a ticket from us, there was never any issues as far as we are aware. If for some reason the driver does not accept the student ID you show, you will have to pay the price difference between the ticket you bought and a regular ticket. If you have any problems in relation to this issue by check in, you can always call our helpdesk, the number is stated on your ticket.